Thread: First video game console? Re: First video game console? I believe the lightguns were extras - never had those! There were older ones I'm sure - what did you have Zincubus? Bought my son a Sega mega drive and a few games which included sonic, ghosts and ghouls, metal slug, golden axe and my favourite the pagemaster which i think is the only game i played and completed! Went on to get Castle of Illusion which had all the family addicted .. Same here, don't remember having the light gun though. Not my only console though, as I've had various others since. My first was a Sega Master System. I've seen ads for various Sega and Nintendo console emulation boxes that can be bought with games built in. My son's gf bought him a SNES emulation box for Christmas and I will be interested to find out what the emulation quality is like. I've long been tempted to get myself a Raspberry Pi and get some retro gaming going. I've barely bought any proper retro games since I got my Retropie, so much easier to play andn my kids can't break my original consoles (as the three year old loves playing Sonic). My first console was the Atari 2600 that I got for my 12th birthday. It was the newer black and silver one. I got some money that day too and the local game shop had a massive collection of 2600 games. My parents went into town and I gave them the money to get me another game. I said "don't get Pole Position" and they came back with Pole Position and a great little shooter called Megamania. Not that Pole Position was a bad game, it was I had played it to death at a friends house. It was bought from Argos and was supposed to come with Centipede, but mine came with Joust and was a much better game and 2 player. Six months later for Christmas I got the Master System and WOW, what an upgrade. It was the last of the old design Master System and came with Alex Kidd, and my parents bought me Golden Axe. Golden Axe because it was a good game had good playground value. Once I got back to school I swapped it with a mate for a loan of his Castle of Illusion. I remember reading about Castle of Illusion in Mean Machines and it looked fantastic, couldn't wait to play it. I was really disappointed when I found out that the Japanese Master System came with an enhanced Yamaha sound chip that gave it sound almost as good as the Mega Drive. Arcade games like Outrun, R Type, Fantasy Zone and Space Harrier all sound amazing with the FM sound chip. I would rather have paid a bit extra for a Master System with the Yamaha FM sound chip than pay the extra £20 for the Master System Plus that came with a light gun and game you play about twice before getting quickly bored with it. Sadly I don't have a Master System in my collection now but I have the Master System converter for my Mega Drive and about 30 games. A lot of my Master System games are FM chip compatible so I think I'll get myself a Japanese Master System at some point. Need an adapter though because the Japanese cartridges are a different shape. No regional lock outs on the Master System, unlike snidey Nintendo. 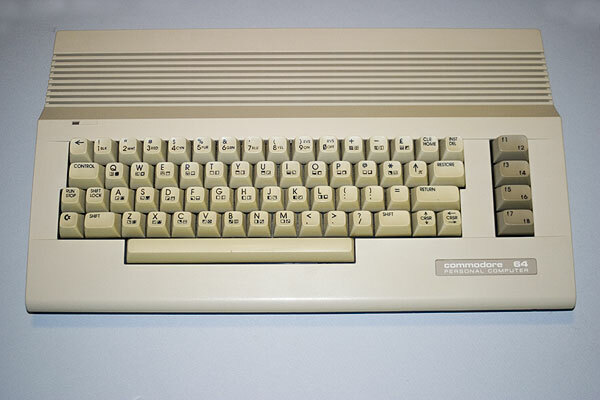 mine was my good old Commodore 64, the C model. got it Xmas 1992. so many great gaming memories. standout games for me were the Dizzy games and text adventures. Old Console and Computers. Any Collectors? Video Game show on BBC in the 90s?